the 26th night of September? Love was changing the minds of pretenders. At least I felt a little like a pretender. 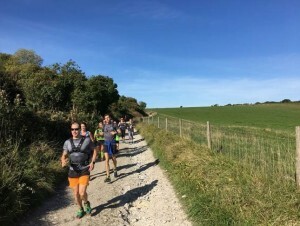 Fresh to the club, I had signed up for the South Downs trail running weekend after my first ever Tuesday Track session. It is possible that I was tired and not thinking straight, but, they do say that some of the best plans are hatched in pubs! 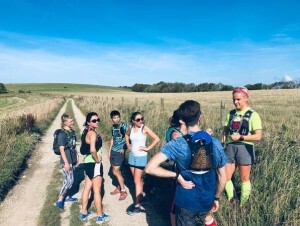 So some weeks, a lot of logistics, a little trail planning and a basic lesson in google docs later, we were all on our way to Littlehampton Youth Hostel for a weekend of running, eating, swimming and celebrating. We congregated in the local Wetherspoon’s as we arrived on the Friday evening, and between exclaiming at the cheapness of the drinks (whole rounds for under £10!) 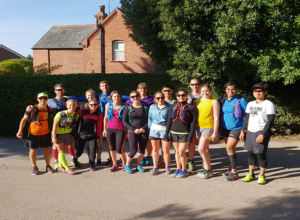 and being introduced to new faces, we tried to gather some idea of which routes everyone wanted to run the next day. Francesco (our fearless leader, shepherd and birthday boy) had found a variety of routes and we were asked to raise hands: 10km? Half Marathon? Marathon? And then I chime in… I’d like to do a half marathon ‘plus’. An Ultra Half. The one distance he hadn’t organised for. Luckily for me, there were others who were keen to do a similar (awkward) distance! As we came off the hill we hunted down those that had already finished, and found them at the golf club, getting stuck in to post-run rehydration and refuelling (aka. beer and chips). We didn’t move from those sunny picnic benches for quite a while, keeping ourselves entertained with stretching, yoga, naps and more ‘rehydration’. When we got back to Littlehampton a small group of us wanted to swim, and as the youth hostel was only 10 mins from the beach, we collected our stuff and wandered down. The water was – as we say in Scotland – absolutely Baltic! I gritted my teeth, my toes, and reminded myself that if I can swim on the West Coast in a bikini, I can swim in the Chanel in a wetsuit! When I (eventually) acclimatised, I was very glad I stuck it out. It was soothing on the achy legs, particularly important knowing that tomorrow I would likely be running another 25 km! That afternoon I learnt that you don’t need to be in a boat to feel sea sick. I get travel sick on most forms of transport (although, thankfully, never on a bike!) – but did NOT expect to feel sick swimming in the sea, so if anyone has any miracle cures or fixes – please let me know!! That evening, after dinner, we managed to surprise Francesco (at least I think he was surprised!?) with a beautiful cake, iced specially for him. It was definitely a team exercise to finish it! On Sunday morning, a very small group of us went down to the beach for sunrise. 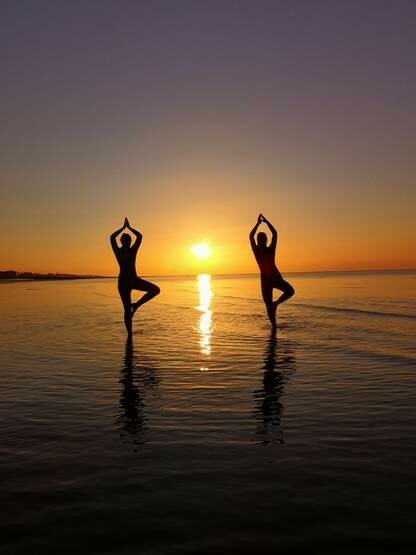 The tide was so far out that to walk to a swimmable depth would take too long, so we watched from the shallows (and had a wee yoga practise / photoshoot!). Others in the group managed to catch the end of the Littlehampton triathlon and cheer on some fellow triathletes! The Sunday run could not have been more different from Saturday, despite the weather being similar. We were doing a recce for half marathon in November and the route is fantastic, with interesting and varied terrain, keeping us literally on our toes. The beautiful woodland trail took us up and down again and again, through pine forest, horse fields, jungle and even down a rabbit hole (or at least it seemed like it!). One stretch of path, not long after we started, was absolutely perfect. It was slightly downhill and soft underfoot, with branches and tree stumps to jump off, over and around. I was so happy I could have sung! I think my trail buddy (the long suffering PK, as seen in photo) may have disowned me, so I sung in my head instead … ‘Ba de ya, running in September, Ba de ya, never was a cloudy daaay!’. Like cycling in someone’s slipstream, it can be disconcerting to travel quickly over uneven ground, without more than one or two steps visibility ahead. 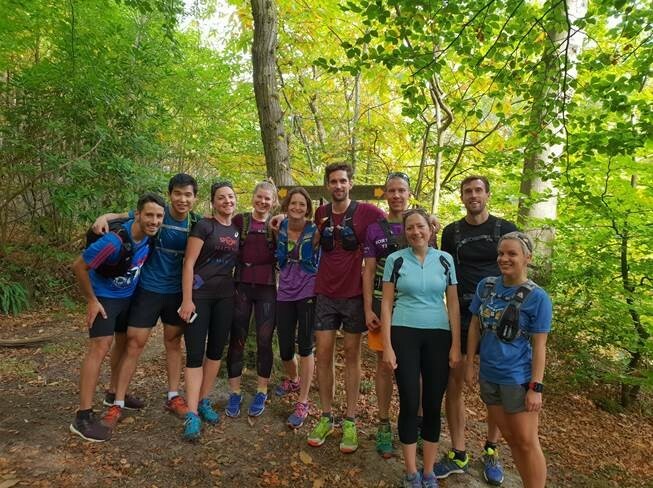 Shouts of ‘heads’, ‘branch’, ‘log’’ could be heard echoing down the line of runners as we snaked our way along the trails. By the time we got back to the cars I was distinctly less energetic than in my singing moments and a lot more achy, but I no longer felt like a pretender. Now a beginner level trail runner – a little more prepared for my first trail marathon (which will already have passed by the time you read this!). We lost no time in finding a great pub with delicious food and much needed coffee, before all going our separate ways. Coming back into London after a fun weekend always involves a come down from outdoor-time high. It was a superb weekend and we couldn’t have wished for better weather, routes, company or activities (Thank you again Francesco!). 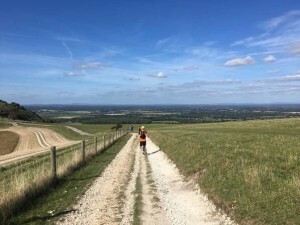 I may be sitting at my desk here in the city, but my feet and my heart are definitely still running around the South Downs singing Earth, Wind and Fire. Now to learn the words properly for that upcoming marathon….